Amanda Dent, Project Manager for the Spinifex Arts Project, discusses new works being exhibited at Japingka Gallery in October 2014. Q: Can you tell us what excites you about this current exhibition? The works that Spinifex artists do are amazing, because they have such integrity, and there's such an intuitive flow to the work. The artists don't necessarily sit down, like a Western artist might, and have a preconceived idea about what the painting is going to look like. The aesthetics are almost by chance, in a sense, because really what people are painting is country and Tjukurpa (dreaming). When artists are painting that, they’re drawing on the creation stories, the law, the religion. This spirituality is part of everyday life for remote desert people. Many Western people can experience religion where the secular and the religious can be quite separate ways of being in the world. For Anangu people it's all one. The religious isn't put up on a pedestal, it's not a high and mighty thing. It's part of the mundane, it's part of everything. That's how Anangu people see the world, so when they are painting they are drawing back to those roots of where they're born. The artists don't plan the work out, they sit down and start painting their country and their thinking. They're in the zone. It's almost like a meditation because they go back to that place, they're in country, they're painting those rock holes, and they're thinking about those stories and the creation beings. In the case of the women's collaborative work, so often when the women paint they come from different areas within the Spinifex lands and bring different stories. Often they tie it together by painting a story that connects them all. The Seven Sisters is a story that traverses huge areas in the Spinifex lands. Q: Why do you think people should go and see this new exhibition? This work is important because it has such strong cultural integrity. There's no preconceived ideas of painting for a market, or what white fellas want. The artists are drawing from what's within them, and just painting that. Many of the artists are quite elderly, in their 70s, 80s and 90s. There’s a few who are in their 60s. They don't have a strong notion of what the art market is and how the art world works. They are painting their culture. That's something very special about the Spinifex group. For most other communities, the first contact people have passed away now. While the younger people are still doing amazing art, it's different because people have a much better understanding of how mainstream culture works. But the Spinifex artists, because of their isolation, still don't have a really clear perception of how mainstream culture works. They're just painting purely from their hearts, painting country in a very Anangu way. Q: I saw that you recently had a work acquired by the British Museum. The Museum were interested in acquiring two collaboratives, of women's and of men's. They purchased a men's collaborative first, which was last year, and then they purchased a women's collaborative this year. Q: What are they saying to you is driving their interest in the work of this group? The high quality of the work - it crosses into contemporary art. It is bold, powerful and dynamic and the cultural integrity of the work draws people in. People can feel that. Q: What do the artists' think about the interest in their work from the wider arts world? The artists don't understand the full significance of what the British Museum is, and how important being in that collection is. Or the Art Gallery of South Australia, or the Seattle Art Museum. On the other hand, they're not surprised that these paintings are going into very important collections. They believe that the Tjukurpa (dreaming), the law of the country, is really important. Most white Australians don't have that, and the artists feel sorry for them, because they haven't got that culture. They haven't got that connection to the country in the way that Spinifex people have. Because they view the Tjukurpa and that traditional knowledge so highly, the fact that it's going into major collections and it's being acknowledged by non-indigenous Australians is not surprising to them. Q: Can you describe the working conditions you have at Spinifex Arts? We have one shipping container where we store all the paints, the linen and the painting materials - everything. In the morning we'll open that container up and spread out the tarps on the earth. Ideally a little bit sheltered from the wind, which is pretty hard because it's windy here a lot of the time. We set up in the shade if it's a hot day. We're really hoping to get some infrastructure built next year that will give us a basic sheltered area. A cement slab, a dog proof fence and shelter from the sun and wind. 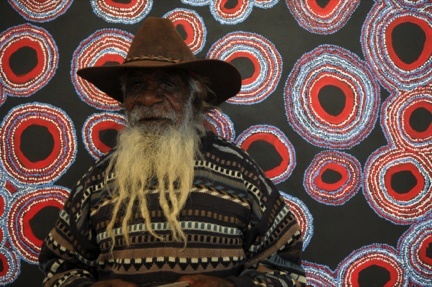 Q: How do you think the recent work of Spinifex artists has been received in exhibitions outside Australia? It has been amazing in Germany. We had a show last year which was incredibly successful. We sent over 30 paintings for the exhibition. It was a big show that toured five German cities, and the gallery rang us up in the very first week in a panic because they'd sold more than half of the show straight away. They desperately needed some extra works. In Germany it has been absolutely incredible. We had a show in Singapore this year that was highly successful. The works are appreciated overseas and we're about to embark on a show in America in 2015.